is another contemporary western hero (with a badge) for your indulgence. list of good guys, and the bad guys are really, really bad! It's been two years since an on-the-job shooting forced ex-Santa Fe chief of detectives Kevin Kerney to retire. He is drawn back into action when Terry Yazzi, his former partner and the man responsible for his wounds, pleads for Kerney's help. Yazzi's son, a soldier, has disappeared in the barren desert surrounding the White Sands Missile Range. Kerney's investigation resurrects the long-forgotten thrill of the hunt--and other emotions surface after meeting the tough-but-beautiful Capt. Sara Brannon, the Army's investigating officer. Together, they uncover a crime far greater than an AWOL soldier: a conspiracy of death that snakes from the secretive world of military operations, to the cutthroat alleys of a Mexican border town, leading them to a final, shocking revelation that may cost them both their lives. 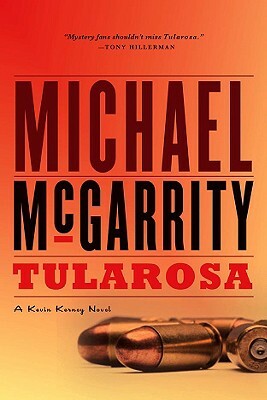 Tularosa is the first book in McGarrity's "Kevin Kerney" crime series.